To evaluate the application value and feasibility of the updated method of trans-gastroduodenal reverse catheterization of hepatic artery in a rat model of Hepatocellular Carcinoma (HCC) via orthotopic implantation of histologically intact tissue. 120 Wistar rats were randomly divided into 4 groups (30 rats/group). Groups A and B were preliminary experimental groups, in which rats were respectively treated with modified and traditional methods of hepatic arterial cannula. HCC model was established in rats of groups C and D by puncture transplantation, where rats were also treated with hepatic artery angiography and interventional embolization by modified and traditional methods, respectively. Comprehensive comparison and analysis were conducted on the success rates of cannula and HCC model establishment, variations of tumor volume, death rates and causes of rats throughout the surgery. The success rate of cannula was 90% in group A and 63.3% in group B. Obviously, the success rate of group A was higher than that of group B (χ2=4.565, P=0.033). In addition, the success rate of cannula was up to 93.3% in group C and 70% in group D. Statistically, the success rate of group C was apparently higher than that of group D (χ2=4.007, P=0.045). During the whole experiments, some rats mainly died from vascular damage, liver injury, and anesthesia accident. However, the success rate of tumor implantation reached up to 100% in rats of groups C and D. The mortality of group D was clearly higher than that of group C during the initial 10 days postoperatively (42.86% versus 10.71%, χ2=5.079, P=0.024), while interventional embolization treatment had no statistical influence on average tumor volumes. The modified application of trans-gastroduodenal artery reverse catheterization of hepatic artery in rats took the advantages of easier operation, higher success rate, lower postoperative mortality, and lesser complications. It was worthy to be popularized in clinical trials and deserved a deeper exploration. Gastroduodenal artery, Hepatic artery, Angiography, Improvement, Rat. Hepatocellular Carcinoma (HCC), a global medical problem, is the second most common cause of tumor-related deaths worldwide . It is generally known as an incurable disease for that overall five-year survival of HCC sufferers is not optimistic with an approximate rate of less than 15%. With a growing incidence of HCC that causes 500,000-600,000 deaths/y, approximately over a million of patients live in the shadow of death brought by HCC [2,3]. Limited therapies available now fail to increase survival rate of patients and improve prognosis. It is an urgent medical affair for us to develop a novel effective therapy available for HCC treatment. Currently in clinical practice, therapeutic strategies for the management of HCC are mainly classified as several types, including surgical resection, liver transplantation, Transcatheter Arterial Chemoembolization (TACE), stereotactic radiotherapy, chemotherapy, and coblation . Of note, TACE, a reasonable and practicable combination of transarterial infusion chemotherapy and embolization, is the first choice for patients with moderate or advanced HCC for whom surgical resection is not preferable [5,6]. Hepatoma carcinoma cells, independent of their derivation from primary or secondary HCC, are supplied dominantly by hepatic artery. On this basis, it is reasonable that hepatic artery chemoembolization could limit tumor growth and extensively cause ischemic necrosis of tumor tissues, which, however, has no significant influence on normal liver tissues for that intrahepatic normal cells are supplied by portal system. However, due to the cumbersome steps and complex operation, TACE cannot be simultaneously performed in large quantities of rats, limiting further scientific researches and clinical spread of TACE. Thus it is of important scientific significance and application value to improve existing therapeutic method. This work was aimed to establish a novel method of selective hepatic arterial catheterization. One hundred and twenty male Wistar rats (aged 18 w, weighed 350-400 g) were purchased from the laboratory animal center of Guizhou Medical University (Guiyang, Guizhou, China). All these rats were randomly divided into 4 groups (30 rats/ group). Groups A and B were the pre-experimental groups. Groups C and D were the experimental groups in which rats were implanted with liver tumor. Rats in groups A and C received treatment of modified cannula, while rats in groups B and D received treatment of traditional cannula. One male immature Wistar rat (weighed 100 g) was also provided for tumorigenesis. The Walker 256 carcinoma, an established model for the study of cancer cachexia, was implanted into the immature rat [7,8]. After centrifugation at 1000 rpm/min for 5 minutes, Walker 256 cell suspension was adjusted to a density of 0.4 × 107 cells/ml. Then, 300 μL cell suspension was subcutaneously injected. Tumor were grown for 8-10 d to achieve a larger diameter of 1 cm and then taken out from the sacrificed tumorbearing rat. 1.5 mm3 of tissue blocks were harvested from fresh tumor tissues in DMEM-filled vessel. Split tumor blocks were implanted beneath the capsule of left liver lobe of rats in groups C and D. Implanted rats were grown in the specific pathogen free clean room and had free access to chow diet and water. Surgical instruments: Straight sharp scissors, straight dissecting forceps, curved dissecting forceps and artery clip, 1# sutures, 4# sutures, pediatric scalp needle (24G-26G), microcatheter (Portex PE10, Wenzel, Germany), ioversol (50 ml/bottle, Jiangsu Hengrui Medicine CO., LTD.), iodinated oil injection (10 ml/bottle, Yantai Luyin Medicine CO., LTD), and adriamycin hydrochloride for injection (10 ml/bottle, Shenzhen Main Luck Pharmaceuticals Inc.). Equipment: Digital subtraction angiography (Axiom artis FA, Siemens, Germany) and computed tomography (CT) (SOMATOM Definition AS+ 128 layer 4D MSCT, Siemens, Germany). Anesthetization and exposure of gastroduodenal artery: All rats were anesthetized with 10% chloral hydrate (3 ml/kg) via intraperitoneal injection. In detail, syringe needle was inserted into the skin subcutaneously about 5 mm and then pierced through abdominal muscles into abdominal cavity at a 45º angle. Liquid medicine was gently injected into abdominal cavity after ensuring that the needle was free and neither intestinal juice nor urine was pumped back. After anesthesia, rats were fixed in digital subtraction angiography examination bed in supine position. After skin preparation, the rat thorax and abdomen were sterilized with iodine volts and alcohol. To open the upper abdomen starting from 5 mm in the lower edge of right rib, a sterile scalpel was applied to cut the skin and create a 15-20 mm incision. Then, tweezers were used to lift the skin incision, followed by cutting off the muscular layer along with the edge of the right rib with a sterile scalpel to expose the liver. Due attention should be given to guaranteeing morphological integrity of liver and small intestine. A cotton swab was used to push away the left lobe up and right lobe down and consequently the proper hepatic artery and gastroduodenal artery, deriving from common hepatic artery, were exposed . Hepatic arterial cannula: Traditional method of hepatic arterial cannula: Gastroduodenal artery, common hepatic artery, and proper hepatic artery were exposed and isolated by blunt dissection from the muscles and fasciae. The proper hepatic artery was gently lifted up with silk thread. The common hepatic artery was provisionally occluded. Micro scissor was used to make a vertical incision in vascular wall with a diameter of 1/3 to 1/2 of blood vessel. The microcatheter was inserted into the proper hepatic artery from vascular wound. Then the artery clip was loosen to restore blood flow. Subsequently, silk thread was used to fix the catheter tip. Common hepatic artery was clamped by artery clip, followed by hepatic arteriography or chemoembolization. After removal of the microcatheter when surgery finished, gastroduodenal artery was ligated and 3-4 ml saline containing 2000 U gentamicin was slowly injected into the abdominal cavity. Then the abdomen was sutured layer by layer after complete hemostasis. 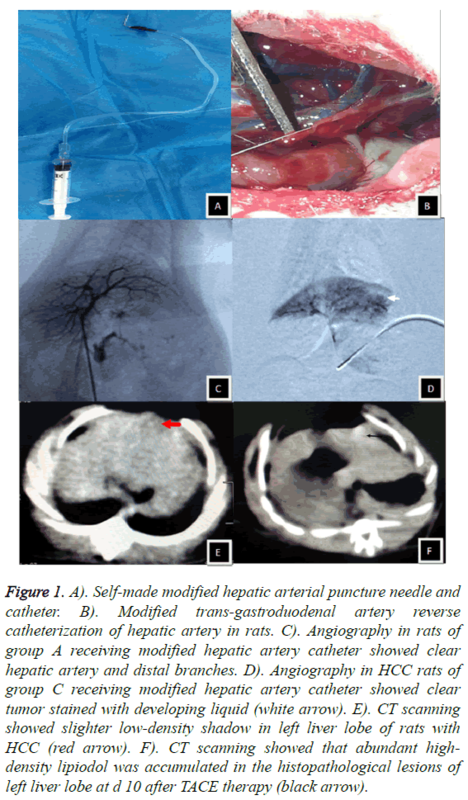 Modified method of hepatic arterial cannula: Self-made puncture needle and catheter were modified from a pediatric scalp needle, which was bent into 90º and connected to a 1 ml syringe with its end. Normal saline was used to not only check whether the needle was unobstructed but also eliminate any air bubbles in the syringe. After the exposure of proper hepatic artery and gastroduodenal artery, the self-made puncture needle was inserted into gastroduodenal artery. Pumping back was performed to guarantee the smooth blood flow. Injection with 0.5 ml normal saline was to confirm that blood vessel was unobstructed and puncture site had no bleeding. On this basis, hepatic angiography was performed immediately. The injection rates of angiography contrast agent and embolization agent were adjusted according to whether there was bleeding at the puncture site in gastroduodenal artery. At the end of the experiment, microcatheter was mildly pulled out. Puncture point in gastroduodenal artery was immediately oppressed by gelatin sponge for 5 min. 3-4 ml normal saline containing 2000 U gentamicin was slowly injected into the abdominal cavity, following the ligation of gastroduodenal artery. Finally, the abdomen was conventionally sutured layer by layer after complete hemostasis (Figures 1A-1D). Figure 1: A). Self-made modified hepatic arterial puncture needle and catheter. B). Modified trans-gastroduodenal artery reverse catheterization of hepatic artery in rats. C). Angiography in rats of group A receiving modified hepatic artery catheter showed clear hepatic artery and distal branches. D). Angiography in HCC rats of group C receiving modified hepatic artery catheter showed clear tumor stained with developing liquid (white arrow). E). CT scanning showed slighter low-density shadow in left liver lobe of rats with HCC (red arrow). F). CT scanning showed that abundant highdensity lipiodol was accumulated in the histopathological lesions of left liver lobe at d 10 after TACE therapy (black arrow). Angiography contrast agent was prepared by mixture of ioversol and normal saline at the ratio of 1:3, which was used at a volume of 1-2 ml for groups A and B. Embolization agent was prepared by mixture of 0.6 mg Adriamycin, 0.1 ml lipiodol, and 0.3 ml normal saline, which was used for groups C and D.
Rats in groups C and D received abdominal CT scanning at d 10 after receiving inoculation of tumor block under a controlled condition of tube voltage of 120 kV, tube current of 25 mAs, and thickness of 2.0 mm. Volume of tumor in left liver lobe was also accurately measured. Tumor volume before chemoembolization was identified as V1. Accordingly, the abdominal CT scanning was also performed in each rat at d 10 after interventional therapy and tumor volume was identified as V2. Here, tumor volume was calculated by the formula of V=ab2/2 (cm3). In this formula, the first letter a was defined as the maximum diameter of tumor, the second letter b was the minimum diameter of the tumor in a vertical direction . Mortality, death causes, success rate of hepatocarcinoma modeling, and changes in volumes of tumors before and after embolization in rats were recorded. All data were expressed as mean ± SD and results were analysed using SPSS 17.0 software. The significance of difference of measurement data was determined by one-way analysis of variance with t-test. The significance of difference in success rates between groups was determined by one-way analysis of variance with chisquare test. Values of P<0.05 were considered to be statistically significant. The success rate of cannula in group A reached 90.0% (27/30). Several reasons resulted in the failure in cannula, among which hepatic artery distortion, anesthesia-related death, and pointpricking bleeding after tube removal when percutaneous radiography finished were primarily responsible for rat death. The success rate of cannula in group B was 63.3% (19/30). Here, one rat accidentally died from anesthesia. Cannula failed due to hepatic artery distortion in four rats. Additionally, cannula failed in two rats of which both gastroduodenal artery and hepatic artery were injured from inappropriate operation. Four rats died from hemorrhage after extubation. The success rate of cannula was obviously higher in group A than that in group B (χ2=4.565, P=0.033). We gained abundant practical experience from the pre-experiments in groups A and B, which contributed to the increased success rates of the following experiments. The success rate of cannula in rats of group C was up to 93.3% (28/30). Herein, one rat died from hepatic artery distortion, while the other died from hemorrhage after extubation. The success rate of cannula in rats of group D was 70.0% (21/30). The causes of failure were attributed to tiny gastroduodenal artery in four rats, inappropriate operationcaused injury of hepatic artery in two rats, and extubationcaused hemorrhage in the other three rats. Obviously, the success rate of cannula in rats of group C was higher than that of group D (χ2=4.007, P=0.045). HCC model was successfully established in rats of groups C and D, which carried with a high success rate up to 100%. CT scanning before interventional therapy visually showed that several lumpy shadows with uneven sizes, low densities, and clear edge scattered in the left liver lobe, while no ascites and nodule-in-nodule appearance formed (Figure 1E). Three rats in group C and nine in group D died during the initial 10 d post operatively. Then CT scanning was performed in the remaining rats survived with HCC. Results clearly showed that highdensity lipiodol suppository was accumulated in the histopathological lesions of left liver lobe. Note worthily, the abundance of lipiodol was negatively correlated with the volume of tumor (Figure 1F). There was no significant statistical difference between the average tumor volumes preoperatively and postoperatively in rats of groups C and D. However, the mortality rate of rats in group D was apparently higher than that in group C (P<0.05) (Table 1). Table 1: Comparison of treatment condition between preoperation and postoperation in groups C and D (*P<0.05). All survived rats awaked in 2-3 h postoperatively and regained consciousness in 6 h, and resumed normal activities and diet in 24 h. The surgical incision healed in 3-4 d without postoperative infection, including wound infection and intraabdominal infections. The murine genome shares similarities with hominid genome, compared with that of canidae, felidae, and leporidae. Rats are the most applied object in both basic and clinical trials, based on its advantages of shorter growth period, moderate body size, powerful reproduction, low cost, low incidence rate of spontaneous tumor, high viability, and strong anti-infection ability . In practice, hepatic arterial cannula could be performed on rats under direct vision in most studies of liver diseases. In several relevant trials, however, surgeries relevant to hepatic arterial cannula were performed on rabbits, dogs, and pigs instead of rats because tiny artery of rats and obstacles from liver and intestine generally led to increased difficulty in exposure and cannula of rat artery. With the development of experimental conditions and plentiful previous studies, cannula has been feasibly performed on rats, but the trouble is that hepatic arterial cannula and embolism are performed by firstly ligaturing the gastroduodenal artery and secondly inserting the catheter into the gastroduodenal artery . In this study, we, inspired by the traditional one, established a modified method of trans-gastroduodenal artery reverse catheterization of hepatic artery. Compared with conventional method, this one has many advantages. Firstly, the method is simple and convenient, easy operation, which can be conducted individually. Secondly, it is easy to manufacture the catheter at low costs. Last but not least, rats have relatively better tolerance to cannula. Traditionally, in order to cut the antetheca of gastroduodenal artery when performing hepatic arteriography or transcatheter arterial chemoembolization, common hepatic artery needs to be clamped for inhibiting the backflow of embolic agent. However, in the modified method, only the speed and volume of embolic agent needs to be controlled to suppress the backflow. This work demonstrated that a higher success rate of cannula was obtained in rats receiving modified therapy while a lower rate in rats receiving traditional therapy. The modified method was characterized by low mortality in 10 d postoperatively, which might be owing to lesser vascular injury and fewer leakage of embolic agent after extubation when chemoembolization finished. It is important for us to completely understand anatomical structure of rat coeliac trunk, hepatic artery, and gastroduodenal artery. The coeliac trunk of rat originates from right front of abdominal aorta at 8-10 mm below the diaphragm pillars. The proper hepatic artery has a length of about 8 mm and a diameter of approximately 10 mm. Initial segment is the axis of the descending pathway to the right front with the representation of “U” shape. The coeliac trunk branches into the splenic, left gastric and common hepatic arteries in counter clockwise direction at the same height with the beginning of coeliac trunk. While, both hepatic artery and gastroduodenal artery are branches of coeliac trunk in a straight line up and down. Common hepatic artery antrorsely extends to be proper hepatic artery and katadromically extends to be gastroduodenal artery, which form a herringbone structure. Therefore, it should be possible to practice the application of transgastroduodenal artery reverse catheterization of hepatic artery in animal experiment studies. Several points should be paid attention to in the process of puncture and cannula. Firstly, modified puncture needle can obviously reduce the free length of gastroduodenum, which can not only be beneficial to puncture but also avoid damage to blood vessels, liver, and intestinal tract. Notably, the success rate of puncture still needs increase. Operate gently and try to avoid repeated puncture when cannula can diminish hepatic and intestinal injury. Secondly, gelatin sponge is applied to lightly press on the gastroduodenal artery after puncture to prevent hemorrhage out of puncture sites. Thirdly, to minimize the damage caused by angiography and leakage of embolic agent, it is appropriate to keep the needle intact and the insertion depth was approximately 5 mm. Fourthly, rat liver has small volume, rich blood supply, lengthy and friable intestine, suggesting that wide tweezers and blunt objects are preferable during the whole operation. Finally, injection with sterile saline containing gentamicin is necessary to prevent postoperative infection and recue the decreased blood volume caused by hemorrhage. In current work, the established rat HCC model of Walker 256 shares similar characteristics with human primary HCC in blood supply and growth pattern. We once again evaluated the effectiveness of TACE chemoembolization on animals by performing the modified and traditional hepatic artery cannula. Previously, Nakamura reported the correlation between adriamycin and adriamycin combined with lipiodol emulsion by hepatic artery injection and found that lipiodol emulsion could facilitate a slow release of adriamycin from lipiodol emulsion and high concentration of adriamycin in tumor body but a low concentration in peripheral blood . In this study, CT scanning at d 10 after surgery visually showed that there was no significant difference between tumor volume before and after treatment in groups C and D. Postoperative tumors, where lipiodol extensively accumulated, were smaller than preoperative ones, suggesting that chemoembolization could effectively inhibit the growth of tumor tissues. Indeed, there existed some limitations that the HCC model applied in this study could not comprehensively mimic human HCC for its deficiency in viral hepatitis and advanced cirrhosis before tumorgenesis. It made it unable to consolidate the concept that the modified method exerted potent interventional effects on rat and human HCC equally. In conclusion, the modified method of transgastroduodenal artery reverse catheterization of hepatic artery has various advantages, including simple procedures, high success rate, low postoperative mortality, less complications, and easy to grasp. This novel modified method broadened the depth and breadth of the basic research on interventional treatment, which was worth to be on deeper researches. Ferlay J, Soerjomataram I, Dikshit R, Eser S, Mathers C, Rebelo M, Parkin DM, Forman D, Bray F. Cancer incidence and mortality worldwide: sources, methods and major patterns in GLOBOCAN 2012. Int J Cancer 2015; 136: 359-386. El-Serag HB, Rudolph KL. Hepatocellular carcinoma: epidemiology and molecular carcinogenesis. Gastroenterology 2007; 132: 2557-2576. Venook AP, Papandreou C, Furuse J, de Guevara LL. The incidence and epidemiology of hepatocellular carcinoma: a global and regional perspective. Oncologist 2010; 15: 5-13. Maluccio M, Covey A. Recent progress in understanding, diagnosing, and treating hepatocellular carcinoma. CA Cancer J Clin 2012; 62: 394-399. Bruix J, Sala M, Llovet JM. Chemoembolization for hepatocellular carcinoma. Gastroenterology 2004; 127: 179-188. Bruix J, Sherman M. Management of hepatocellular carcinoma: an update. Hepatology 2011; 53: 1020-1022. Wintzell M, Lofstedt L, Johansson J, Pedersen AB, Fuxe J, Shoshan M. Repeated cisplatin treatment can lead to a multiresistant tumor cell population with stem cell features and sensitivity to 3-bromopyruvate. Cancer Biol Ther 2012; 13: 1454-1462. Xiao, H, Li S, Zhang D, Liu T, Yu M, Wang F. Separate and concurrent use of 2-deoxy-D-glucose and 3-bromopyruvate in pancreatic cancer cells. Oncol Rep 2013; 29: 329-334. Lafortune M, Denys A, Sauvanet A, Schmidt S. Anatomy of the liver: what you need to know. J Radiol 2007; 88: 1020-1035. Carlsson G, Gullberg B, Hafstrom L. Estimation of liver tumor volume using different formulas - an experimental study in rats. J Cancer Res Clin Oncol 1983; 105: 20-23. Kehinde EO. They see a rat, we seek a cure for diseases: the current status of animal experimentation in medical practice. Med Princ Pract 2013; 22: 52-61. Li X, Wang YX, Zhou X, Guan Y, Tang C. Catheterization of the hepatic artery via the left common carotid artery in rats. Cardiovasc Intervent Radiol 2006; 29: 1073-1076. Nakamura H, Hashimoto T, Oi H, Sawada S. Transcatheter oily chemoembolization of hepatocellular carcinoma. Radiology 1989; 170: 783-786.